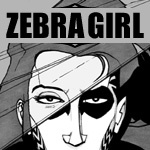 Zebra Girl is the story of Sandra Eastlake, a young woman forced into a supernatural lifestyle. Transformed by a magical fluke into a demonic creature, she vacillates between humanity and malevolence, slipping between extremes, attempting to learn a balance before choosing between friends and fellow monsters. A monochromatic urban fantasy told since the turn of the century.